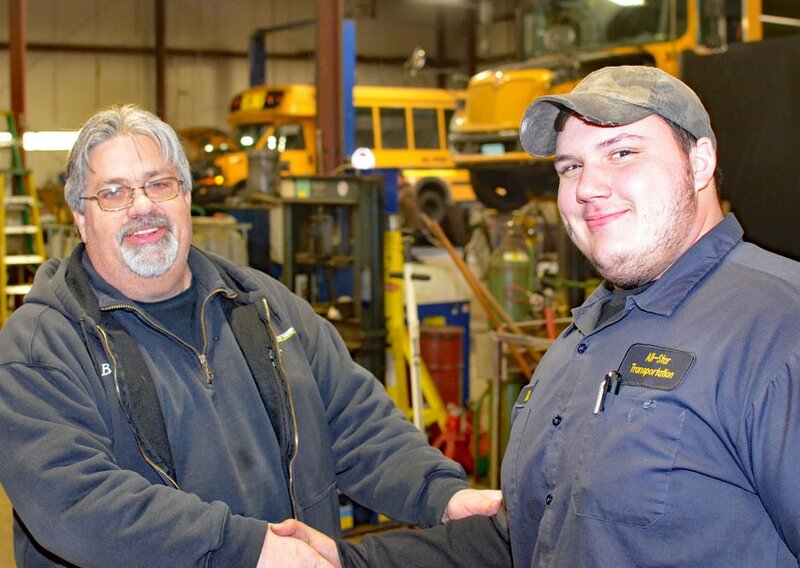 SEYMOUR – At age 19, Daniel Garrett has achieved something that many service technicians twice his age or older have not accomplished – he’s been certified as a master school bus technician by the National Institute for Automotive Service Excellence. Garrett is a service technician at All-Star Transportation’s terminal in Seymour. He’s one of All-Star’s youngest mechanics, joining the company full-time immediately after graduating from Emmett O’Brien Technical High School in 2016. 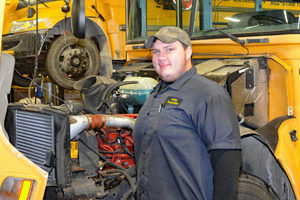 To achieve master technician status required Garrett to successfully complete a series of six difficult exams that tested his knowledge of several mechanical systems specific to school buses. Garrett passed his sixth test just prior to Christmas, completing all six tests in less than two years. The master technician course work and tests are done online, which required Garrett to spend his free time studying and learning more about school bus mechanics. “I studied a little after work,” he says modestly. “I passed my first test in Fall 2016, and then set out to pass at least one new test every season.” The six required tests are Body Systems & Special Equipment, Diesel Engines, Drive Train, Brakes, Suspension & Steering and Electrical/Electronic Systems. Garrett says he decided to pursue the special certification after speaking with Steve Rosko, All-Star’s director of maintenance, who encouraged him to continue to learn and improve. “It’s something to do for yourself. It means you are capable when you are certified,” Garrett explains. Capable is a good word for describing Garrett. He was an A student in high school and, during his senior year, one of his teachers recommended him to All-Star. He started working at the Seymour shop part-time during the spring of his senior year, and then joined the staff full time after graduation. “My main goal after high school was to work with diesels, and I am doing that,” he says proudly. Next, he says he plans on taking a seventh test that’s included in the school bus master technician curriculum. The test, Air Conditioning Systems & Controls, is not required to gain certification, but Garrett is intent on learning more. “Then I am taking heavy truck certification, and I’ll just keep on taking more of the tests,” he says with a smile. I am one very proud mom of the accomplishments that my son has achieved. The sky is the limit when you set high standards.